Feeling curious because one Moto Z model did get the Pixel Launcher some months back according to users on the Motorola Users Forum India. I am not a member there so could not confirm with those who are on MFN and posted screenshots of Moto Display, Moto Actions , About Phone and Quick Settings pages from the G5 Plus soak test.Those posts were removed later. Have they posted screen shots of homescreen ? Here you go. With app shortcuts menu. When will we see Android 8 in US? After Android 9 (P) is released and Pixel 3 phone is on the market?? Definitely after Android 9 (Pie) has been released, because that's already happened for Pixel 2 users. But nobody here can give you an accurate answer about the release date. We know that 8.1 is currently being soak-tested in Brazil and India, for (at least some) people on the Motorola Feedback Network. But we don't know how long it will take for the soak test to become a general release - and then there's the question of how fast it will spread to each region. Keep monitoring the forums and you'll be able to see when the release starts and how fast it is progressing. I got the notification for the 8.1 system update around noon Indian time. Downloaded the update just after reaching home. Now going to install it. Hope you all get the 8.1 soon too. Woohoo!!! Tell us what you think about the new version. I like it mostly but I had to go into each app's notification setting to turn off vibration with notification - tried my patience. I also did not like that they had removed the cache clearing part from storage settings. I have SD Maid installed (Pro version) and also Files Go and Solid Explorer. It will be like using a different phone this week with a lot of changes. This is the first time I got notification for a system update in the middle of the day, but then it is rolling out in batches in India - for all phones of the G5 series - some are getting it in the morning . some on a Sunday. Has anyone any solid information about when this will hit the USA phones? When you have chance to check out the 8.1 update, please give us a review. Well I had my g5plus fixed a few days ago and put it on charge today (going to be a back up phone) and apart from 32 apps needing to be updated it had a oreo 8.1 update pending (UK user by the way). it also had a security update form September as well. so my older phone is going to have a slightly better spec than my newer moto g6plus. According to Lenovo that'll be getting android pie next year, 1st quater. Oreo 8.1 for Moto G5 (not G5+ or s) now ready for download in the UK. kodak2 its definitely ready for the uk spec moto G5 plus as that's what I have. Sorry, bit of a misunderstanding. I should have said that it was available for the G5 in the UK, but I didn't know about the other variants. 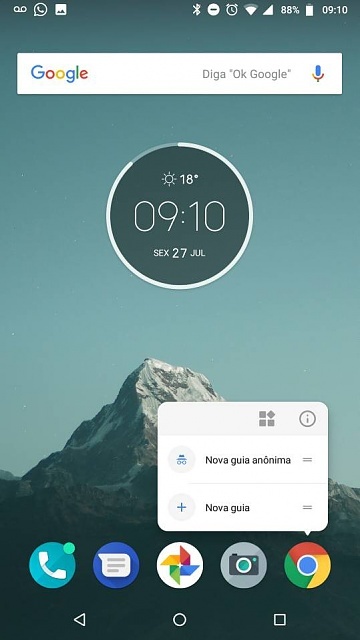 Since updating to Oreo there is a delay of about 5 seconds when I wake the phone, by swiping the screen, before the home page appears. During this time the screen is blank. A Nokia 6.1 Plus in my family got the 9.0 update yesterday. The default launcher has changed from Launcher 3 to Quickstep Launcher which is actually the Pixel Launcher with At A Glance widget and searchbar in dock etc. Sorry for posting a Nokia phone information here but just wanted to say this in relation to Pixel launcher. Android 8.1 on the G5+ is running fine and the phone seems to be working faster. I got the October Security Patch today on my G5 Plus, region India. I had to clear the cache partition, Recovery Mode, to speed up my phone because it started to get sluggish after the 1st week of installing Android 8.1. So far, the phone's behaving OK.